It’s a pretty decent Saturday today, with some interesting things on the horizon to talk about, so let’s get right to it! We’ve also got new expansions for Imperial Assault and Eldritch Horror released this past week, which both look pretty exciting! I did pop into my local GW today, and picked up two of the new Citadel paints – Waystone Green and Skullcrusher Brass. They’ve released four new metallic layer paints that look very much like replacements for current metallics, but with a better coverage or something. I’m not particularly convinced, but I bought the brass to try it out. The snow texture paint Mourn Mountain Snow has disappeared from my local store, which has prompted me to re-evaluate my Necron army. All of those metallic guys have been based in snow, but as they were some of the first models I painted, I’ve noticed that I try to match the earlier, crappier paint jobs whenever I add to the force. However, I’m thinking I may start a smaller force with a completely different look, predominantly with brass rather than silver armour. Stay tuned for that, anyway! In addition to the metallics, GW have released three technical paints that essentially allow you to paint better gemstones. I find this an interesting prospect, so bought one pot to see what it’s like. I’m actually planning to try it on the second Necron force’s weaponry, which might be exciting! Fiddling with the new #Necrons for #WarhammerConquest – looking to build around Anrakyr! Returning to Fantasy Flight but staying with Necrons, I managed to get my first game of Conquest with the new faction yesterday, playing against the game store guy’s Tyranid deck. I played him a few weeks back when he’d just built this one, and managed to get my first victory in Conquest for what feels like ever, but didn’t manage quite so well this time around! The deck used Anrakyr the Traveler as warlord, and I wanted to try out a large number of the Necron cards so only went for ten enslaved allies, focusing on cheap mooks who would do something other than just act as a meat shield. 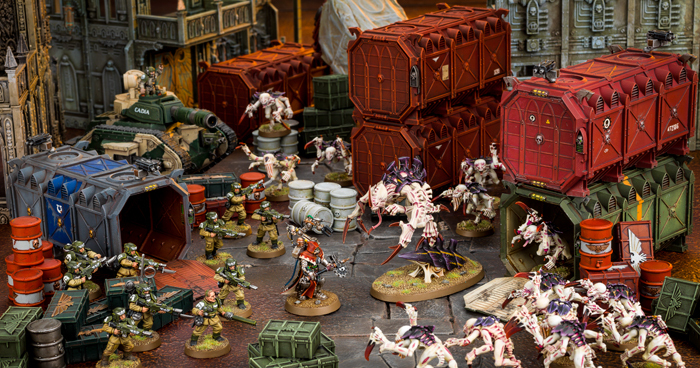 It actually went really well for a while, but my warlord was bloodied and, in the final climactic battle, died instantly to an Ymgarl Genestealer due to its +2 combat rating while the Tyranid warlord was at the same planet – yikes! It was a really great game though, and I really enjoyed both the challenge of getting the deck built with so many out-of-faction cards, and seeing card versions of the metal warriors that I feel so attached to, having painted up nearly 2000 points of them! 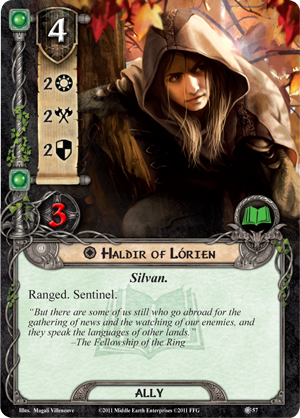 Finally, and sticking with LCGs, I wanted to talk about Lord of the Rings. It’s a card game that is so very close to my heart, though one that I haven’t played in a very long time, despite continuing to collect the expansions for it. I’ve often called it my favourite game of all time, yet I actually haven’t opened the latest adventure pack, despite having bought it two or three weeks ago. 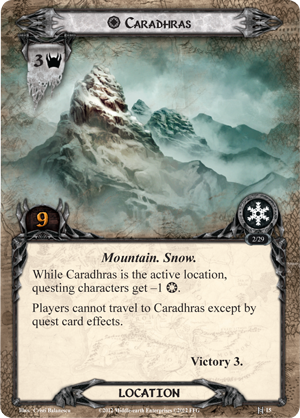 It made me wonder whether the magic has gone now that the game has become so bloated: I haven’t looked at changing my decks for a long time, I haven’t played any of the new quests from Ringmaker or Angmar Awakened, and my attempt to run through the Saga expansions didn’t get further than the very first quest! 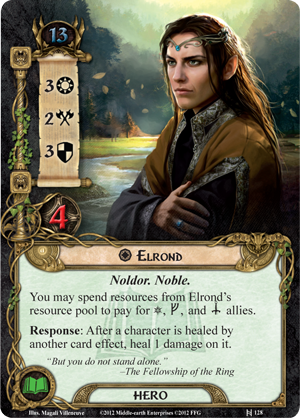 I played three of the early quests, using my elf deck headed up by Elrond, Legolas, and spirit Glorfindel. 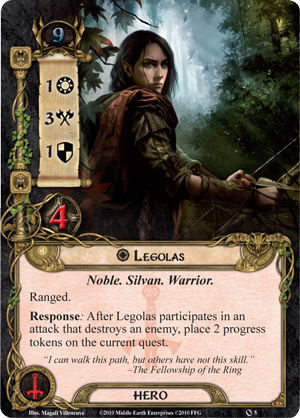 First off, I tried my luck with Passage through Mirkwood, which is a quest I think a lot of people ignore, or use merely to test their decks with, but is one I enjoy for its classic feel. I managed to win fairly easily, though those Dol Guldur Orcs did manage to deal a lot of damage to Elrond as my primary quester! I then tried my hand at The Dead Marshes, another underrated quest in my view! I like this one because of the Escape test mechanic that forces you to quest slowly to ensure you have the willpower to pass the test after the quest phase. 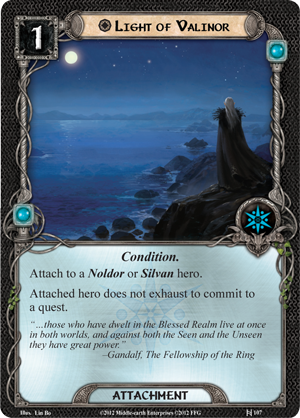 However, I managed to draw into the combo I needed really quickly, which put Light of Valinor on Glorfindel, allowing him to quest without raising threat and provide a chunk of willpower to the Escape test, and Arod was on Legolas to ensure the maximum progress could be placed! I also managed to use Elf Stone to bring out Haldir for free, which was great! It was over pretty quickly, with only one resource token on Gollum meaning the final Escape test wasn’t all that climactic! Finally, I went for The Redhorn Gate. This is one of those quests that I love, yet find so brutal at times that I just want to cry in a corner. 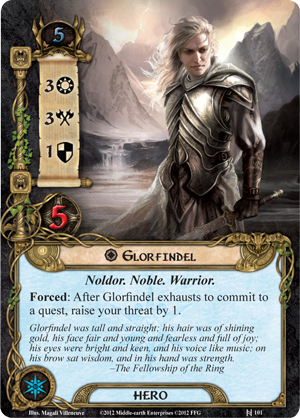 Some early bad luck kept discarding my resources, which meant I couldn’t get any momentum at first, but again had a first-turn Light of Valinor on Glorfindel so that I could keep him questing and attacking. 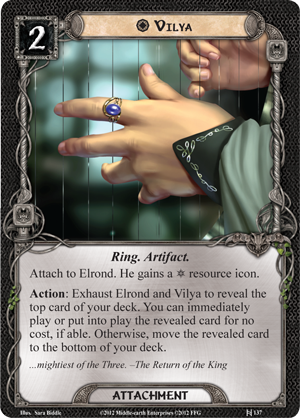 I also managed to get Vilya on Elrond, though that card is predominantly in the deck for flavour as I was using him as my prime questing hero. Being able to quest for 10 was a real boon with Caradhras in the staging area until stage 3B, of course, and still having at least six attack power could deal with most threats while a series of cheap allies chump blocked them. It was really nice to get back into this game, and I sincerely hope that I can start playing it more often in the coming weeks and months. Especially since I’ve finally started to mix up my decks! I’ve had four decks built up for at least two years now, and haven’t touched them at all. Getting rid of one after Hunt for Gollum last month left me with my dwarfs, my elves, and my Rohan/eagles decks. 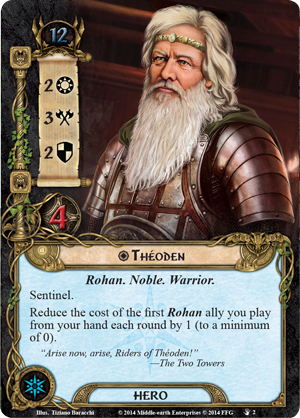 I’ve swapped out a couple of cards from the elves one now, as there have been quite a few good cards to come out of the last cycle and couple of deluxe expansions, and the dwarf deck has had a very minor tweak. The biggest change, for me, is that I’ve gotten rid of the eagles from my Rohan deck, making it straight Rohan. 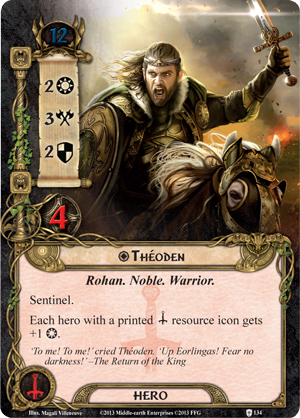 In all honesty, I wasn’t quite sure what I was doing after stripping all o the eagles out – there are a lot less pure Rohan cards than I was expecting, so I’ve gone for a few Valour events to see what I’ve been missing as a bit of a filler. I may find myself putting the eagles back soon, however, or else swapping Théoden (from tactics to spirit) so that the weight falls into spirit rather than tactics, I guess we’ll see! Looking through all of the cards again, however, has gotten me really excited to try building new decks, one of which I’m keen to build is another all-purpose fellowship kind of deck, which may indeed kickstart my efforts to play the Saga expansions once again! Let’s hope this comes to pass, anyway!